Michelle Davies | The Journal Gazette The Belmont Brave Bots team, from left to right, Cole Walchle, sophomore, Seth Wallace, sophomore, and Jacob Corral, sophomore, control their robot during competiton in Saturday's YBOT, Youth Building Our Tomorrow, at Ivy Tech. With Video. Michelle Davies | The Journal Gazette Izzy Kranz, a junior at DeKalb High School, works on her team’s robot during the Youth Building Our Tomorrow competition Saturday at Ivy Tech Community College Northeast. After the two-minute match had ended and they had beaten Bellmont High School 71-35, members of the Anderson Preparatory Academy robotics team politely shook hands with their competitors, picked up their small robot constructed from Erector Set-like materials and calmly returned to their work station. Bellmont did the same, except that the team wearing the red T-shirts returned to its station and quickly began making adjustments for future matches during the day, especially since Bellmont could face Anderson Prep again. "It’s kind of funny," 16-year-old Bellmont sophomore Seth Wallace said. "We’re not playing for anything but pride, essentially, and a trophy that we get to keep for a year. "But there’s so much competition between the schools. Anderson is considered the school to beat because every year, they have a really strong bot, and they have a really strong team and strong leadership. Overall, they’re just a powerhouse of a team." As it turned out, Anderson Prep defended last year’s championship by winning the Youth Building Our Tomorrow title at Ivy Tech Community College Northeast. 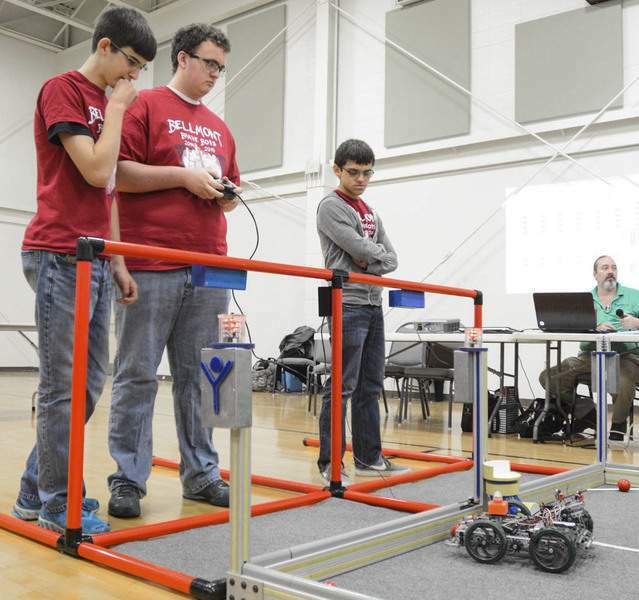 Saturday’s event drew 10 high school teams in a robotics competition. In addition to Anderson Prep and Bellmont, other schools that competed were Carroll, DeKalb, Leo, North Side, Northrop, Snider, South Adams and West Noble. 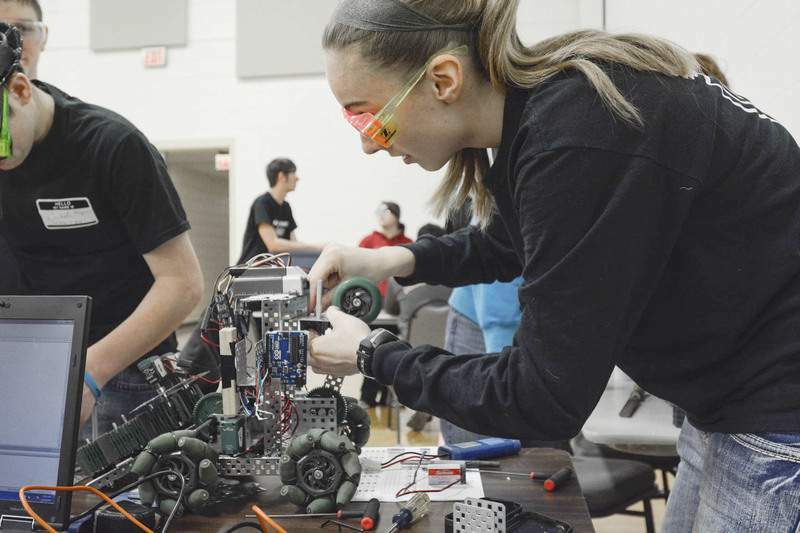 According to Mike Bierbaum, one of the four organizers of the Fort Wayne event, any school that shows an interest in fielding a robotics team may receive a robot building kit, valued at nearly $1,200 and funded by General Electric. Construction of the robot begins in December, and competitions are held January, February and March. Saturday’s event was the season finale, ending in a bracketed tournament. Team points are awarded when the robots, constructed on four wheels and weighing between 5 and 10 pounds, complete a series of maneuvers. Volunteer judge Forrest Herman, an employee at BAE Systems, is a product of previous competitions. "Until I actually was involved with the robotics team, I was pretty certain through the majority of high school that I was going to go to school for computer science programming," said Herman, 24, who graduated from South Side High School. "Then after I joined, I knew I enjoyed the robotics. It was during robotics I decided to get my degree in mechanical engineering."